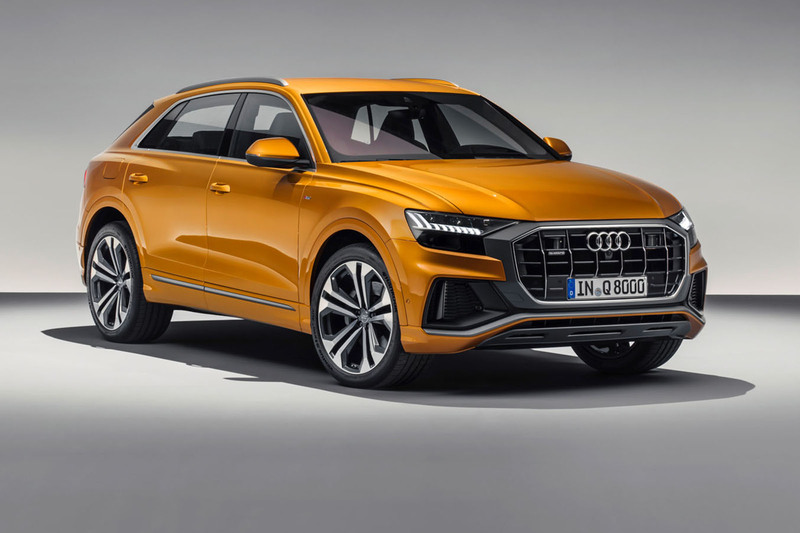 The new Audi Q8 will give the Range Rover Sport its sternest challenge yet as the battle for sales of style-led premium SUVs hits new levels of intensity amid unprecedented — and still growing — global demand. Priced from an estimated £65,000 and powered by a choice of 3.0-litre petrol and diesel engines, the Q8 is also set to go head to head with German premium rivals including the BMW X6 and Mercedes-Benz GLE Coupé. Last year Mercedes was the world’s largest seller of premium SUVs, closely followed by Audi and BMW. Land Rover was a distant fourth with sales volumes around two-thirds the size of those of its rivals. Although the Range Rover Sport is regarded as the most iconic design in the segment by UK buyers, with this new Q8 Audi has followed the trend for more extravagant styling established by the X6. Sascha Heyde, exterior designer for the Q8, told Autocar that the team working on the car were commissioned with a brief to ensure the firm’s new flagship SUV is immediately recognisable on the road and acts as a ‘halo’ for the brand’s other models. 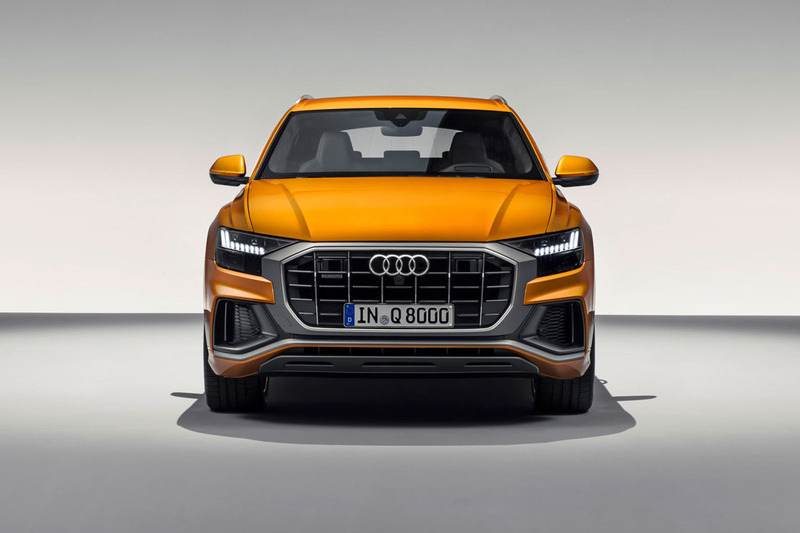 As well as the strikingly coupé-like roofline and frameless doors, notable styling flourishes include the new-style upright grille design, which features six vertical chrome fins; bulging wheel arches inspired by the design of the famous Quattro (and which are now a design feature on all new Audis including the Audi A6, A7 and A8) and the option of 22in wheels, the largest ever to be offered by the factory. Technical design flourishes include a full-width light across the rear. It incorporates a new LED arrangement that projects a striking 3D shape and emphasises the car’s width. Although the Q8 is shorter than the Q7 on which it is based, this is entirely down to the smaller overhangs at the front and rear of the car. As such, interior space is nearly identical, although the Q8 has a strict five-seat layout, whereas the Q7 can be had with seven. The Q8 is 130mm longer than the Range Rover Sport, as well as being 100mm lower and 10mm wider. Its wheelbase is also 70mm longer, underlining the additional interior space that it offers. Boot space is 650 litres with the seats up and 1755 litres with them down, compared with the Q7’s 770/1955 litres. 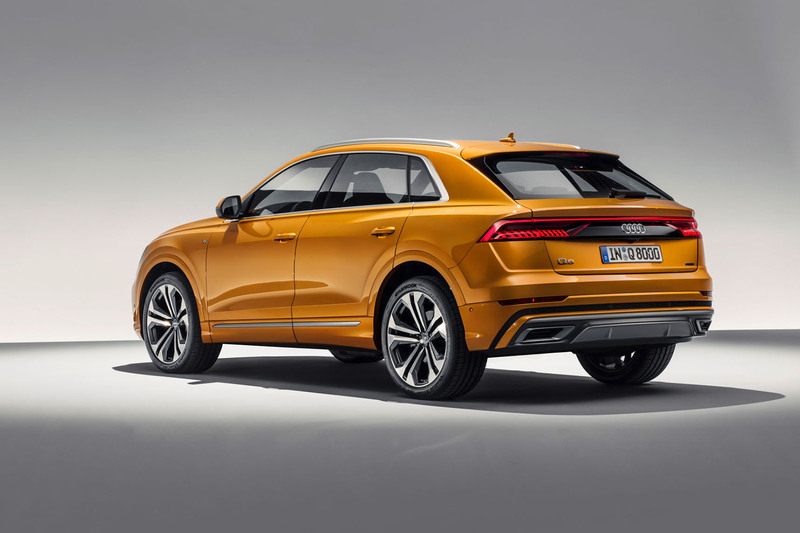 While the roofline is 40mm lower than that of the Q7 at its highest point above the front doors, the slope is achieved in part by design sleight, particularly with the use of the dropping roof spoiler. As a result, and based on our opportunity to sit in the car, space in the rear is sufficient even for tall adults. The Q8 is also 27mm wider than the Q7, a result of engineers seeking ways to make the car more stable and agile. Aluminium has also been extensively used on the retuned five-link front and rear suspension, in order to save weight, although the car’s total weight is yet to verified. 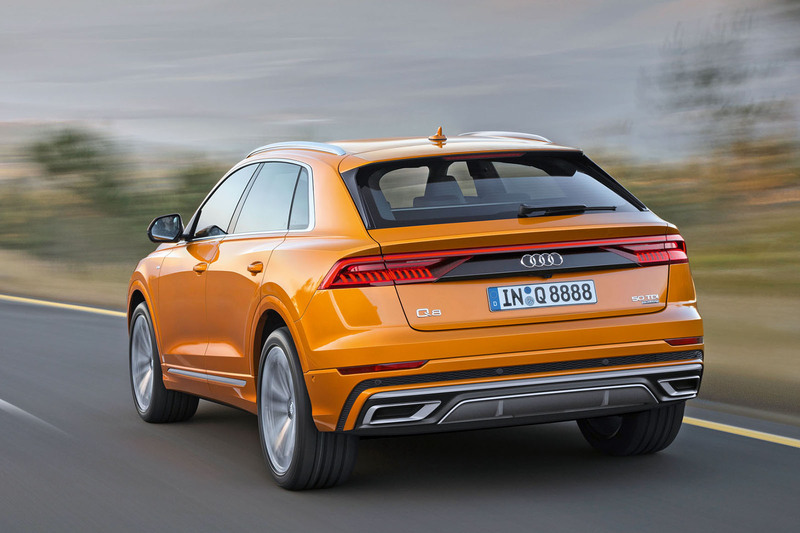 The mechanical centre differential is set to transfer power 40% front, 60% rear as standard, while buyers can also opt for the four-wheel-steering system pioneered on the SQ7 to improve low-speed manoeuvrability and high- speed stability. As standard, the car has seven selectable driving modes that alter the settings for the suspension, steering and engine, ranging from off- road modes to more sporting set-ups. The Q8 can also be specified with one of three different types of suspension, two of which employ air springs to improve comfort. 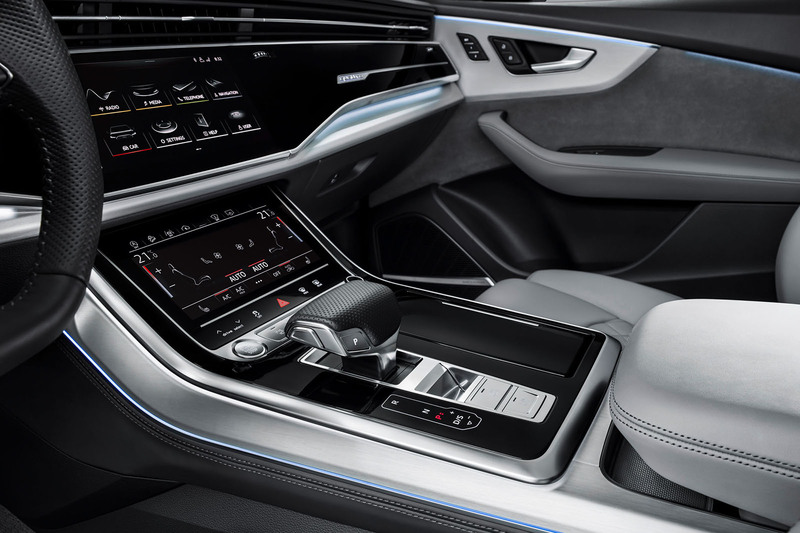 Inside, the influence of the new A8, which was revealed last year, is evident, most notably with the new control system for the major functions, which are spread across two large touchscreens. The upper 10.1in screen controls the infotainment and navigation functions, while the lower 8.1in screen controls the heating, ventilation and air conditioning systems. While these allow the dashboard to have very few buttons on it and give the interior a minimalist look, in the A8 the system has drawn some criticism for its usability. Similarly, the interior finish and choice of electronic driver aids are reminiscent of those of Audi’s range-topping saloon. While treatments vary according to the trim level, there is abundant use of leather and chrome. Buyers can choose from numerous enhancements, including four types of leather, three types of seat design and a choice of sound systems that is crowned by a 23-speaker Bang & Olufsen set-up. Buyers can opt from four driver assistance packages, which range from a low-speed system that autonomously drives the car in a line of traffic to a system that warns of potential impacts and which can contact the emergency services if it detects an accident. In total, there are 39 driver assistance systems available. Two trim levels - S line and Vorsprung - will be offered in the UK initially. Initially UK buyers will have a choice of two 3.0-litre engines: a 335bhp petrol in the 55 TFSI and a 282bhp diesel in the 50 TDI. The only performance figures released so far are that the diesel can accelerate the Q8 to 62mph from rest in 6.3sec, has a 144mph top speed and 442lb ft of torque. The petrol will feature an eight-speed gearbox, with a seven-speed S tronic unit for the diesel. A less-powerful 228bhp 3.0-litre diesel V6 – the 45 TDI – will be offered several months after launch, once the initial rush in demand for the car has slowed. All three engines employ fuel-saving 48V electrical technology, as pioneered on the SQ7. No other performance or economy figures have yet been released. 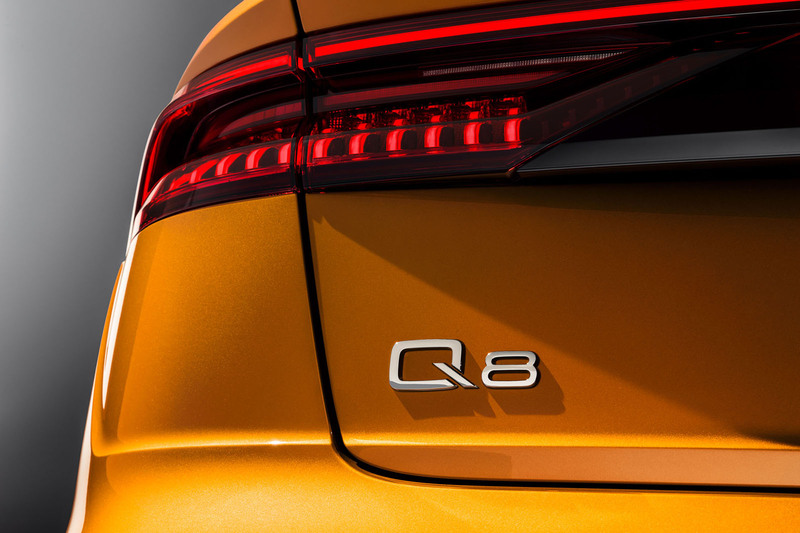 However, it is already anticipated that hotter versions of the Q8 will be produced, potentially including a next-generation SQ8 that could be offered with a petrol- electric hybrid powertrain. The Q8 was first revealed as a concept car, and then followed by another, sportier concept, called the Q8 Sport Concept, which was powered by a 444bhp 3.0 TFSI V6 petrol engine plus electronic assistance from a 20kWh motor, boosting total outputs to 469bhp and 516lb ft. The Sport Concept was claimed to be capable of hitting 62mph from rest in 4.7sec and powering on to a top speed of 171mph. UK order books for the Q8 open later this month, when prices will also be confirmed, with deliveries from August. 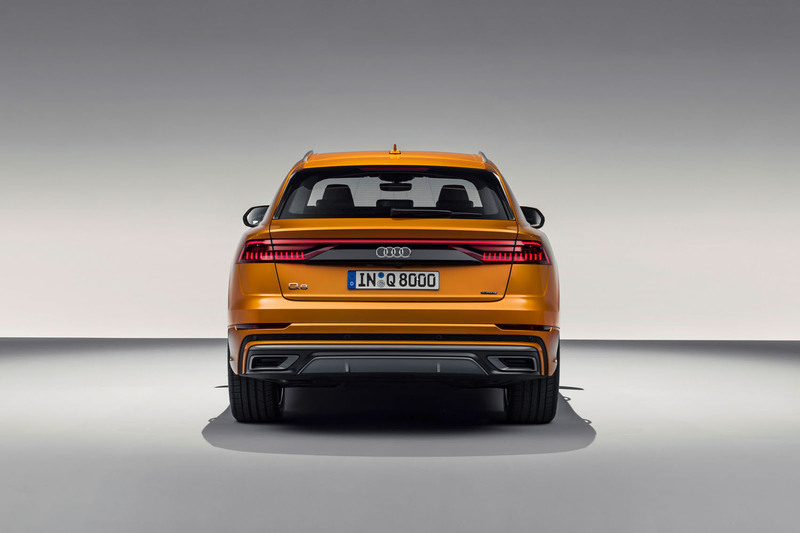 You’ll note that the Q8 is larger in just about every dimension than its rivals: the Range Rover Sport, BMW X6, Mercedes-Benz GLE Coupé, Maserati Levante, Porsche Cayenne and even the Tesla Model X.
Munoz also highlights another future trend that is fast emerging but which Audi and others have yet to address: hybridisation. “Global sales of the six main rivals to the Q8 totalled 250,000 units last year, up by 5% [on the previous year],” he says. “However growth has started to become moderate as the current models get older and,most clearly, the lack of alternative fuel types is affecting the demand. Doesn’t have a very coupe-ish roofline so looks immediately less offensively hideous than an X6. Actually looks perfectly fine. Would have no problem having one of these in the driveway. I would be very sceptical with the 3 litre diesel as being recalled for a fix on othe rAudi and Porche models,hence Porche deciding to scrap diesels untill they have an acceptable one ready for launch ie that does not cheat. Yet another hideous tank SUV. Will their next diesel guzzler be called the Saudi? Nice of Audi to pay homage to the Gulf States when naming their less economical vehicles. Remind of something Italian, just recently launched, can anyone guess which Brand I’m talking about, and, do you agree.....? From the rear yes, but sideways the window line is less raked and more elegant. At a quarter/third of the price I wouldn’t mind one of these on my driveway. Beats an X6/GLE coupe any day, and looks as attractive as a RR Sport. Well done Audi. 27mm WIDER than a Q7!?!? Well that rules it out of using virtually all the UK's car parks!